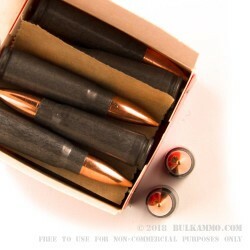 This 7.62x39mm cartridge by Red Army Standard Ammunition features a 123 grain projectile with a full metal jacket surrounding its lead core. That jacket not only protects your rifle’s bore against fouling, but also gives this round superior penetrating power. This cartridge’s relative inexpensiveness is owed in part to its steel casing, which is more economical to produce than brass at the trade-off of being non-reloadable. The casing does sport a polymer coating to facilitate feeding and ejection, however, so it’s still a good shot for your dollar -- if only once! Red Army Standard is a trademark of Century International Arms, an American company. In their effort to keep their Soviet era weapons’ ammunition authentic, they manufacture their cartridges in Russia and other nearby Eastern European countries. If you would like a 7.62x39mm round from as close as you can get to the place of its invention, this is one of your best bets.